One of the most elaborate houses in Herculaneum, the House of the Stags was designed to make the most of its sea views. Situated in Insula IV, Cardo V, the House of the Stags was a high status Roman Villa in the seaside town of Herculaneum. Named after the marble statues found in its peristyle garden, it was extensively re-modeled before the eruption of Vesuvius in 79 AD. Its layout was designed to make its spectacular sea views as much a feature of the house as its architecture. The house of the stags was excavated by Maiuri between 1929-1932. A stamp on a loaf of bread found preserved in the house identified its last owner as Q Granius Verus, a member of a successful merchant family. The house appears to have been first built during the reign of either the Emperor Augustus or Claudius. It was completely re-modeled not long before the 79 AD eruption of Vesuvius. The atrium was the only part of the original house to survive the rennovations. The rest was completely redesigned to link a series of interconnected rooms and spaces with the spectacular sea views the villa enjoyed. Usually an underground corridor, the cryptoporticus in the House of the Stags was a covered walkway above ground that linked the various rooms and features that made up the re-modeled house. It’s decor indicates that it was not a service corridor but a public access way for guests. 64 individual wall paintings known as pinakes ,depicting still life pictures of birds, plants and cherubs were painted at intervals along its walls. The floor was a mix of mosaics and opus sectile flooring. The cryptoporticus’s role was to provide a dramatic build up to the rest of the house. In between the paintings were a series of narrow openings that allowed glimpses of the peristyle garden in the centre of the south east wing of the villa. These views were not fully revelled until the guests reached the areas of the house allowing the most dramatic views: the garden and the grand dining room or cenatio. Views were an important feature of the house. Two stairways led to an upper story and then onwards to a terrace or rooms overlooking the sea. But the garden below was the centre of the main visual axis, acting as a nexus point between the seaviews and the redesigned house. On the seaward side was aterrace and pergola overlooking the coast. Directly opposite were the grandest rooms of the house. The garden was specifically designed to connect both visually, drawing the eye to the areas the owner wished to highlight. The main garden feature found by Maiuri was a group of statues consisting of a statue of Hercules, a satyr with a wine skin and the stags that gave the house its name. These were carefully arranged to draw attention to the opening to the grandest room of the house, the cenatio. The Cenatio or Main Dining Room. The cenatio or banqueting hall was situated on the south side of the garden. It was lavishly decorated with a marble floor and wall dado. It obtained extra impact from the views it afforded to diners. 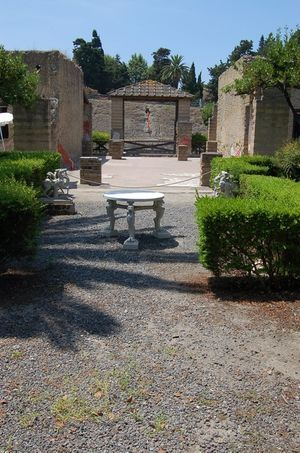 The garden statues that attracted attention to the cenatio also drew the eye in the opposite direction creating a visual axis between the dining room and the sea view beyond the garden. Windows punctuating the walls of the room increased the visual impact of the room further. Herculaneum: the excavations, local history and surroundings by Maria Emma Antoinetta Pirozzi . Electra. Naples. The World of Pompeii (2007) Ed John J Dobbins and Pedar W Foss. Routledge: London and New York.